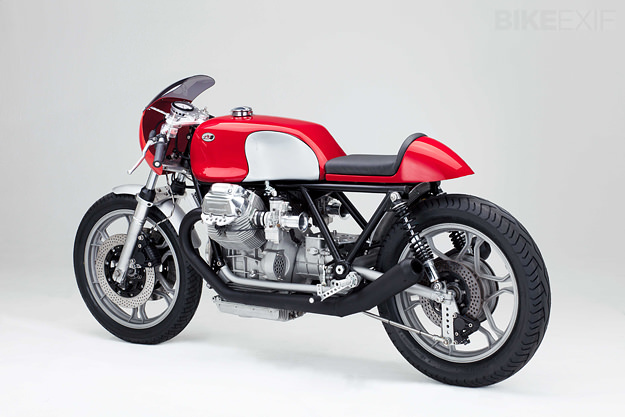 Axel Budde builds the cleanest, coolest Moto Guzzi cafe racers around. This is his sixth build and the best yet, fresh out of his workshop in Hamburg. 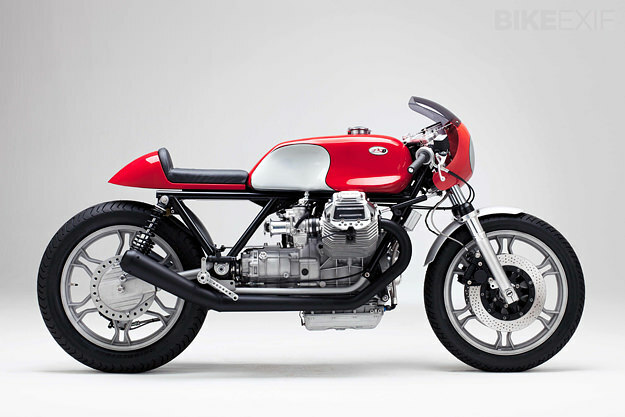 Kaffeemaschine #6 is based on a 1980 Le Mans frame and was commissioned by the British motorcycle racer Brian Cowan, who wanted a high-performance Guzzi for the European vintage race scene. Cowan’s brief was simple: the bike had to be fast, finished in red and silver, and have cast wheels. He got what he wanted. The completely rebuilt motor is a V11 unit boosted with an HTMoto hot cam and valve kit. The heads have been ported and polished, and are now dual plug; the rest of the engine has been blueprinted and balanced to extract every last ounce of power. 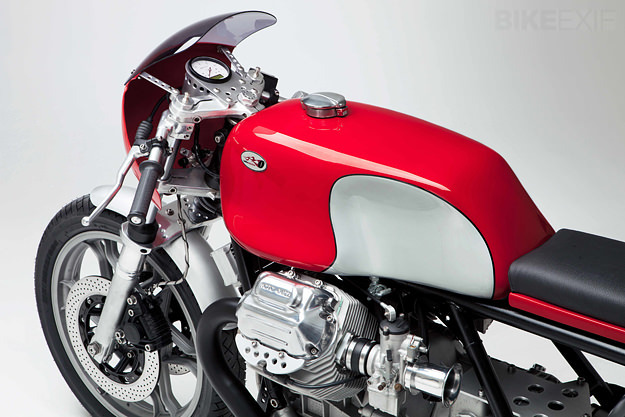 The sleek looks come from a modified Le Mans Mark 1 fairing and a fiberglass tank in the style of the limited edition Guzzis produced by Arturo Magni, and the bike weighs just 176 kg dry. The forks are from a 750S, but upgraded with modern internals. At the back, the shocks are custom-built Ikons, and the brake system is new and improved throughout. Most other parts are handcrafted, as usual with Kaffeemaschine bikes. 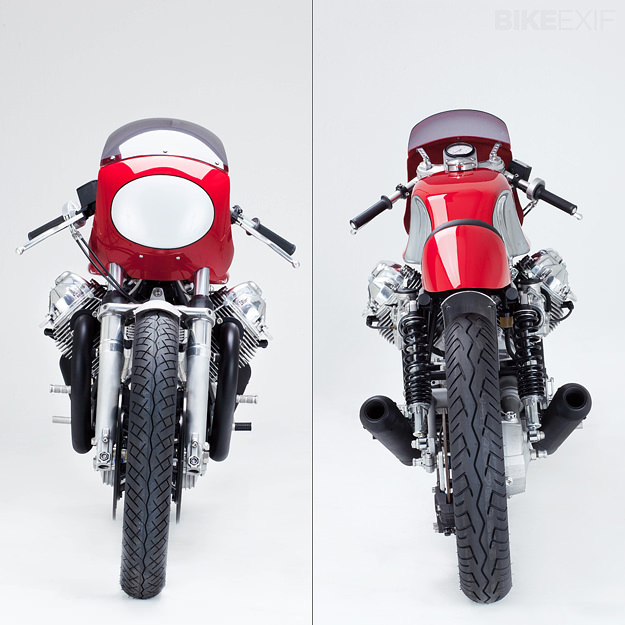 Head over to the Kaffeemaschine website for more details (and beautiful images) of Axel Budde’s Guzzi cafe racers. 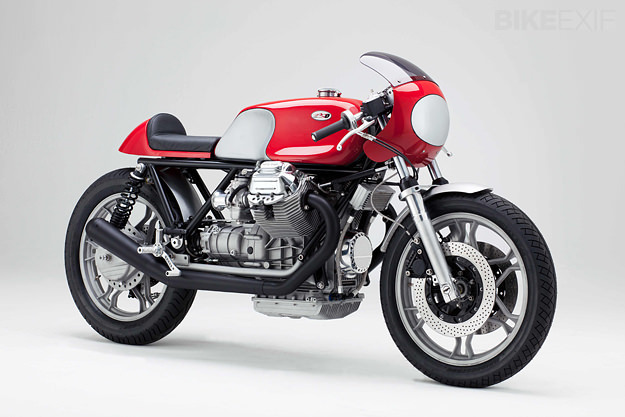 It begs the question: why buy a new bike, when an older machine like this can be so desirable?